The following information is a synopsis of the material dispensed during our one day underwater photography seminar. This is a work in progress and is, by no means, the complete story or a definitive work. It is intended to give a beginner or intermediate enthusiast a basic knowledge of underwater photography in just a couple of hours before getting in the water to practice. There is no substitute for lots and lots of supervised and constructive practice with someone who can answer your questions! This information is offered freely; no warranty or guarantee is given. No animals were harmed in the preparation of this report. You’re serious about quality output from your camera and you want to produce images that could be proudly framed. For that reason, set the image quality to RAW. Taking jpeg photos, especially in lower resolution, may be fine for snapshot occasions like Christmas or a birthday party but RAW mode is called for when you want the highest quality prints. The image processor in all digital cameras captures the raw photo. In most consumer level, pocket-sized cameras, that raw image is immediately dumped into a processor, which then spits out a jpeg photo on the memory card. Higher end cameras, including the D70 and similar digital SLRs, offer the option of outputting the complete RAW photo to the memory card. Any digital processing is done by software in your computer, rather than by the camera. Jpeg is a compression algorithm that discards some of the extra pixels in order to create a smaller image that loads, transmits, and copies faster. A full size RAW file coming out of the D70 is about 4.5 mb. The same image taken in the highest quality jpeg mode will be about 1.9 mb. More than half of the data of your precious photo of a dolphin giving birth is discarded by the conversion and compression process!!! Also, Jpeg photos only exist as 8 bit files whereas RAW images are 16 bit files. Think of this as the equivalent of an 8 lane highway compared to a 16 lane highway. Which version has more data about the image? As underwater photographers wanting to produce the highest quality image possible, it only makes sense to want as much of the original data as possible. You will need software to convert and edit the RAW image. This is usually supplied with the camera but there are also excellent third party programs for this, too. Adobe Photoshop and Photoshop Elements are considered by many to pretty much be the pinnacle. The Automatic mode or the Program mode will work great for topside photos but they do not work well for underwater photography. This is not a limitation of any particular camera; it is a limitation of the concept of TTL (Through The Lens) metering, in use in most modern cameras. Light meters (both internal and handheld, external models) and TTL systems attempt to balance colors and obtain a properly exposed photo by adjusting the camera settings to achieve an 18% gray. Granted, this is an overly simplified version of what is happening inside the camera’s logic circuits but it is accurate enough for our discussion, here. The end result underwater, with a camera set to A or P, is going to be a less than pleasing image. The background water will often be gray and nearby subjects or reflective subjects will often be totally blown out (see lighting basics). You might occasionally get a “keeper” shot but probably not as often as you would like. Best results are obtained underwater when shooting in full manual mode. It may seem like yesteryear’s settings but it works and requires less fiddling than you might think. Assuming you have clear water… 70 to 100 foot visibility… it is daytime between the hours of about 10:00 am and 3:00 to 4:00 pm, and it is a moderately sunny day, the following settings will work as a good starting point: ISO 200, Manual mode, shutter speed 1/60th of a second, and an aperture of f5.6. Set your meter so it turns off after 30 minutes (you don’t want it turning off in between shots) and your preview mode to hold for 20 seconds. That’s long enough to be able to evaluate the shot but not so long that it significantly drains the battery. It is also a personal preference to swap the command dials so the f-stop adjustment is on the rear of the camera and the shutter speed adjustment is on the front. In the water, you will adjust the f-stop much more often and the control knob is much easier to reach. Try it both ways, if you like, and see which is easier but most people seem to agree. Single shot, single focus. Avoid continuous focus as it will not require the autofocus to lock before taking the photo. Turn on the gridlines. This will help keep horizons horizontal and verticals upright. Spot metering, single area autofocus. Whatever you put the center rectangle on is what the autofocus will lock on and is what the light meter will evaluate. Very first thing, always lightly run your fingers over the lens port to remove any bubbles that might be clinging to the surface. You can do everything else perfectly but still ruin a shot by having a bubble clinging to the port. When you settle into the sand or establish neutral buoyancy at your diving depth, pick a brightly colored sponge or coral head about three feet away from you and take a photo. Check the results. If the image is properly exposed, begin your dive. If the background water is too dark or too light, adjust the shutter speed (see below). If the subject sponge or coral head is too dark or blown out, adjust the f-stop. Take another shot and recheck your adjustments. When you’ve got the settings pretty close for that time of day in that location with that lighting, you’re ready to begin your dive. Don’t worry, with just a little practice, this can be done in less than a minute. The resulting images will be well worth the minimal delay. Shutter speed controls the ambient (sunlight) light in the background water. F-stop controls the amount of light entering the camera that originated from the strobe and bounced off of your subject in the foreground. F-stop = strobe light, shutter speed = ambient light. Given the dive conditions we discussed above under Basic Settings… clear water, between 10:00 am and 4:00 pm, moderately sunny day… 1/60th and f5.6 will be a good starting point for 60 feet of sea water. A shutter speed of 1/60th will produce a pleasing blue in the background water. F5.6 will produce reasonably saturated colors from subjects that are medium reflectivity. In Lighting Basics, we will start here and build upon it, adding in more about controlling the strobe and dealing with changing conditions. Light entering the camera lens is controlled by shutter speed and aperture (f-stop). Leave the shutter speed setting as is but increase the f-stop to the next higher stop without moving the camera or light source and you have reduced the amount of light reaching the sensor or film plane by one half. Lower the f-stop by one full stop and you have opened up the aperture, doubling the amount of light reaching the sensor or film plane. The same is true of changing only the shutter speed. Full f-stops commonly found on lenses used for underwater photography include f2.8, 4, 5.6, 8, 11, 16, 22, and 32. Many cameras will allow selection of one half or one third stops between the full stops, producing numbers like f6.3 or f10. Shutter speeds can be very, very slow or very fast but the practical range for underwater use runs from 1/30th of a second, to 1/60th, 1/125th, 1/250th, and 1/500th. Changing nothing but the shutter speed and bumping from 1/60th to 1/125th will let in half the amount of light. Adjusting from 1/60th to 1/30th lets in twice the amount of light. As with aperture settings, many cameras will allow increments of one half or one third between shutter speeds. If all camera settings remain the same but the light source (strobe) is moved closer to the subject by half the distance, twice the amount of light will reach the sensor or film plane. Conversely, double the distance between the strobe and the subject and half the amount light will be recorded. The subject must take up about 70% of the frame for the TTL sensor to accurately measure the amount of strobe light needed. This works great if you’re shooting the side of a ship or the wall of a reef. However, if a queen triggerfish swims up a few feet in front of you, wearing a top hat and singing about the virtues of Broadway, TTL will most likely fail miserably. The reason is the fish is surrounded by open water and is less than 70% of the frame. Open water is 70% of the frame, which is a huge light absorber. TTL will instruct the strobe to dump a full power flash, rather than meter just enough light to properly expose the fish. The result will be an overexposed or blown out subject. This is not a weakness or design flaw; it is the nature of TTL. Even with cameras that can communicate TTL to the strobe, it is best to leave it set to full power manual when shooting wide angle or fish portraiture and control the lighting with f-stop in order to avoid chronic overexposure. Since TTL works best when the frame is filled with the subject, it works much better on macro. You’re up close to the subject, which is often right up against the reef or other structure, and TTL can accurately meter the amount of light needed. Here’s why I don’t recommend TTL for macro use: TTL meters the light, reducing the amount needed, and the photographer then must lower the f-stop, appropriately. F-stop, in combination with distance to subject, also controls the depth of field in a photo. F5.6 four feet from your subject has a much greater depth of field than f5.6 from 12 inches. One of the things we fight in macro photography is not having enough depth of field, anyway. Reducing the f-stop in order to be able to use TTL metering is actually counterproductive! Instead, leave the strobe set to full power manual. This will force the f-stop to be increased to avoid overexposure and, at the same time, will maximize the depth of field. Logical, isn’t it? 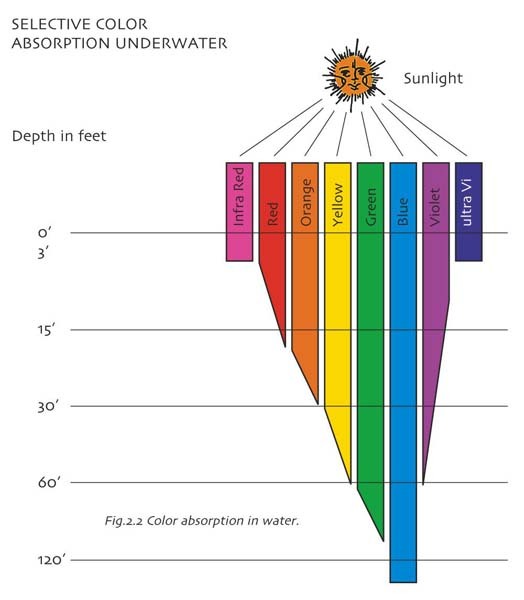 In your Open Water course, the instructor talked about the light absorption properties of water and how one band of color is lost for every ten feet you go below the surface. Water has the same absorption properties horizontally. For example, light travels from your strobe through five feet of water to your subject and is reflected back across five feet of water to your camera lens. That light has traveled a total of ten feet and you are already losing the reds. No matter how powerful the strobe is, none can counteract this inherent property of water. For this reason, strobes cannot effectively light a subject more than about five or six feet away. One way of judging the maximum effective distance to a subject is to point your camera straight down the length of your body. Point your toe so your fin tip is extended as far from your head as possible. For the average size person, the tip of your fin is at the maximum effective distance for a strobe on a camera in front of your mask. Another method is to extend your arm straight out to your side, holding one handle of the camera housing. The tip of the strobe is about five feet from your mask. Regardless of which method you use, any target inside that zone can be adequately lit by your strobe. Anything outside of that zone can still be a subject but may or may not be properly lit. As more and more of the water column comes between you and your subject, it will begin to take on progressively more of a cyan cast and color will fade according to the ROY G. BIV bands. This can be a positive thing, in certain circumstances like wreck photography. When photographing large subject like wrecks, reef walls, whale sharks, etc, even a very wide wide-angle lens will not take it all in from five feet away. However, you may be able to compose a shot with part of the structure or subject within the range of the strobe and the rest falling off into the blueness. This gives an interesting sense of depth. There are also times when it is appropriate to simply turn off the strobes and shoot with ambient light only. Before 10:00 am and after 3:00 to 4:00 pm (depending on the time of year), the sun is low enough in the sky that more light bounces off the surface of the water than penetrates. This affects the amount of ambient light in the water and directly affects your settings. When the sun goes behind a cloud and the water suddenly gets dimmer, there is, again, less ambient light. The deeper you go… yep, less ambient light. For wide angle and medium-sized “fish portraits”, point your strobe straight ahead. Even in clear water, there is always particulate matter floating in the water column. When your strobe light goes out, it will strike the particulates and bounce back on a reciprocal angle. If your strobe is pointed straight ahead, the light will bounce straight back. If it is angled toward the camera slightly, the light has a better chance of bouncing toward the camera lens and showing up in the shot as “snow” or backscatter. Backscatter = bad! Subjects closer than about two or three feet may require an adjustment of the strobe position and angle. The DS125 and some other varieties have a built in modeling light. Using that function, you can see exactly where the light will fall when the strobe fires. Modeling lights do reduce battery life (though a DS125’s modeling light can stay on for the entire length of a night dive with little difficulty) so if you decide to forego such use, you can manually aim the strobe head. Recall that water makes everything appear larger and closer than it actually is. Aim the strobe slightly above and behind where you perceive the subject to be and you should be pretty close. Macro subject are generally those that are closer than about 12 to 14 inches. Typically, shutter speed has little bearing on macro subjects as they are primarily lighted by strobe light, which is controlled by f-stop. See “Distances” below for additional discussion. To repeat, because this is important, given the dive conditions we discussed above under Basic Settings… clear water, between 10:00 am and 4:00 pm, moderately sunny day… 1/60th and f5.6 will be a good starting point for 60 feet of sea water. A shutter speed of 1/60th will produce a pleasing blue in the background water. F5.6 will produce reasonably saturated colors from subjects that are medium reflectivity and are two to five feet away from the camera. Subjects can be broken down into three general categories of reflectivity: Reflective; normal; and light absorbers. Fish such as barracuda, Atlantic spadefish, and grunts are very reflective. So is most sand. If these or similar fish are within a few feet of the camera and are essentially perpendicular to the camera lens when a strobe is fired, most often the fish will be blown out or radically overexposed. This can be compensated for by moving the strobe further away from the target, increasing the f-stop (higher number, less light in), or by shooting on a bit of an angle. Shooting on an angle may help with certain fish but will not help much when low to the sand. Be aware of the surroundings. If your subject is a small gobie and it is sitting on white sand, the light reflected from the sand will be intense and the f-stop will need to be increased to compensate. Average reef structures and fish such as angelfish or rays tend to be fairly neutral. An f-stop of f5.6 or f8 will work just fine for most of these opportunities. Light absorbing subjects like wreck structures, midnight parrotfish, and goliath groupers hiding under a ledge do not reflect much light so the aperture will need to be opened to allow more of the available light in through the lens. F4.5 or less could be required. The shallower the dive, the more sunlight penetrates so a faster shutter speed is needed to produce the same pleasing blue background water. The deeper the dive, the less ambient light and therefore a slower shutter speed. My general rule of thumb on shutter speeds is 60/60, or 1/60th of a second for a dive depth of 60 feet for pleasing blues in the background water. (Getting the idea that this is important?) Above 40 feet, a shutter speed of 1/125th of a second will usually work well. If the dive depth is 75 feet or below, 1/40th to 1/50th should be a good starting point. Developing a routine in diving and sticking to it usually leads to success in diving. The same goes for underwater photography. Carefully prepping your housing before the dive is not the end of the story. Once you enter the water, wipe your fingers gently over the surface of the port to remove any micro bubbles that may be clinging. Settle on the sand at the bottom or establish neutral buoyancy at your dive depth and take a test shot of a section of reef with some open water in the background using the recommended settings mentioned above. Examine the image and adjust the settings, as necessary. Remember, shutter speed controls the ambient light in the background and increases or decreases the amount of blue in the background open water. F-stop controls the amount of strobe light hitting your subject in the foreground. There are specialty lenses for certain applications but they might not necessarily serve you better than a good quality zoom lens. For example, the Sigma 14mm wide angle lens is the widest rectilinear (non-fisheye) lens on the market. It is great for shooting wrecks or wide panorama reef scenes but its no good for fish portraits, which is what we do a lot of. Most of the time, we're taking fish portraits of various size critters. Rarely are these fish beyond about 6 feet away, which is the practical range of our strobes. The D70's 18-70mm kit lens is excellent for such subjects and allows you get in close for semi-macro, too. My workhorse lens is an 18-35mm but the 18-70mm kit lens can get in much closer, when needed. In the old zoom lenses, 25+ years ago, there was a loss of quality when compared to the prime lenses, those that had a fixed focal length. That is no longer true. Even pros will put a modern zoom lens up against a prime lens without hesitation. Some basics... a film SLR with a 50mm lens sees things in the same perspective and range your eye does. Anything less than a 50mm is considered wide angle. Anything greater than 50mm is considered telephoto. Most of the digital SLRs have an imaging surface that is smaller than a 35mm negative (there are a couple of high end models that are considered "full frame") so they only see the center part of the lens. There is some math we could go through but the bottom line is digital SLRs have a kind of magnification effect (they don't, but that's the easiest way to explain it and understand it). Most are 1.5, meaning a 50mm lens for a film SLR that is put on a digital SLR will see the equivalent of a 75mm (50mm x 1.5 or 50mm + 25mm) lens on a film camera. If you took the 105mm lens often used for macro and put it on a film SLR, the image in the viewfinder would not look nearly as magnified as it does on a digital SLR. There are a few lenses that have been specifically designed for digital cameras but they're expensive, yet, and not really practical for underwater photography since closer is better in everything except ultra wide angle. The Nikon 18-70mm kit lens and the Nikon 18-35mm lens are both standard zoom lenses. Applying the magnification factor to the 18-70mm lens, the result is equivalent to a 27-105mm lens (18-70 x 1.5 or 18+9 to 70+35) on a film camera. Reasonable wide angle with good zoom potential. For shooting things like mantas and sharks, remember that most of the time, they are not going to get close enough to you for the strobe to be highly effective. The vast majority of the time, they will be outside the range of the strobe or in the marginally effective range. Being able to zoom to 70mm is highly desirable under such circumstances. Almost enviable, in fact. If your concern is that you really have to zoom your current lens to decently frame a shark or ray, consider that it may just be too far away to get a proper photo of it. A snapshot, yes. Something that is sharp with well-balanced color and exposure, unlikely. You may want to avoid larger lenses such as the 24-80mm lens, which would effectively be 36-120mm on a digital SLR. Great zoom but terrible for the larger fish that do approach you. When a manta swims in, you would not be able to zoom out far enough to get as much of the face as possible with the shorter zoom lenses such as the 18-70mm or the 18-35mm. This tip kind of falls into all three categories. The D70 has a maximum flash sync speed of 1/500th of a second, according to the documentation. However, if you place a small piece of scotch tape over the rear two flash contacts on the hotshoe before installing a flash unit or the sync cord for an external flash unit, the camera will still fire the flash on time but it doesn’t really “see” the flash attachment so it ignores the 1/500th limitation. Correctly exposed flash photos can be taken all the way up to and including 1/8000th of a second. This is very useful if you’re shooting upward at a seafan or reef edge and would like to illuminate it with a strobe but the sun is behind the subject so a high shutter speed will be required to balance the ambient light in the background water. Try it… it really does work. Capturing the sun’s rays as they penetrate the water is highly desirable. It is only possible when the shutter speed is 1/350th or higher. Shooting upward toward the sun, trying to capture a sunball on the surface and pleasing blue water around it, peeking around the silhouette of the dive boat, over the edge of a reef structure, or around the edge of a wreck can be a dramatic photo but it requires a higher shutter speed than you may suspect. Shutter speeds in the neighborhood of 1/500th to 1/1250th are common for such shots. The D70 has a maximum flash/shutter sync speed of 1/500th of a second. See above for a way around that. Human eye likes light sources from the upper left. There are exceptions when the only way to get the shot is to temporarily position the lighting beneath the housing. Close focus/wide angle strobe positioning. Working with a buddy can be a rewarding experience. A dive buddy not only helps ensure your own safety but can also act as spotter. Work out pre-arranged signals for when you need help corralling a subject. As underwater photographers, we never touch or harass marine life or the reef. However, seahorses, for example, instinctively turn away from people. Working as a pair, your buddy can cautiously and calmly move closer to the seahorse, causing it to turn toward your camera. This also puts the buddy in the shot, adding perspective and human interest. If the subject is a critter, the eye or the teeth or both must be in focus. Looking down on a subject makes it appear flat and uninteresting. For critters, you want to be as close as possible to eye level or preferably slightly below, looking upward. If the water has lots of particulate matter or backscatter, try to shoot subjects with reef or sand behind them. This can hide much of the backscatter problem. Shooting a subject on a reef edge, on such a day, with lots of open water in the background will inevitably leave you with backscatter issues. When photographing people, waiting until the subject has exhaled and the bubbles have cleared the frame before taking the shot. Bubbles are distracting and can downright obscure the subjects face. The next section concerns etiquette and the interaction between photographers and non-photographers, on a dive boat and in the water. It was originally written by Stephen Frink, owner of Frink Photo and Directory of Photography for Scuba Diving Magazine, and is republished here with his permission. Getting a good photo is no excuse for damaging the environment. This is where we underwater photographers are most vulnerable to criticism. Adding a camera and strobe will affect buoyancy, and once the eye is glued to the viewfinder, depth perception and peripheral vision are reduced enough so that even a skilled and concerned diver might accidentally bump into coral. In addition, the technical limitations of underwater photography require proximity to the subject in order to maximize color and resolution. Get too close, catch a bit of surge, and, regrettably, accidents do happen. Those photographers who truly care about the reef will learn and practice optimal buoyancy control. Unfortunately, there are also callous photographers who are willing to damage the reef in pursuit of a photo. You've seen them lie in a patch of fragile staghorn to get close to a butterflyfish, or wedge their fins between boulder corals to steady themselves for a wide-angle shot. Is it possible they simply do not know better? Not likely in this age of eco-enlightenment. We now realize the reef is a finite resource, and no one should be allowed to trash it purposely, whether in pursuit of tropical fish for the aquarium, food for the table, or even photos for a slide show. Doing so is criminally wrong. Harassing marine life for the sake of a photo is wrong. Too often, photographers assume that because they're holding a camera, they should get best access to marine life encounters. Don't forget that the non-photographers are paying for the dive, too. Photos of purposely inflated pufferfish or divers riding turtles show a lack of respect for sea life and the marine environment. These photos shouldn't be taken, and certainly should not be rewarded by being published or considered in photographic competitions. But there are other, less obvious ways marine life may be harassed photographically, sometimes by a photographer and sometimes by those assisting a photographer. I've watched divemasters plunge their hands in the sand to drag garden eels from their burrows and then hold them for a photographer's macro framer. Tossing a shrimp into the water column to photograph it against a black background often results in a yellowtail swooping in to eat your subject. Even the seemingly benign act of hand feeding a fish can cause it harm. There is the obvious consideration of inappropriate diet, but more significantly, hand feeding bears the risk of desensitizing fish to a potential threat from humans, especially in areas where hook-and-line or spearfishing is allowed. Just because you hold the camera doesn't mean you automatically acquire eminent domain over all marine life encounters. If you see a diver observing something of interest, wait from a respectful distance and approach for the shot when the other diver is finished. Don't ignore dive safety in pursuit of a photograph. This is my prime example of "do as I say, not as I have all too often done." For too many years I dived too deep, stayed too long, and performed careless zigzag profiles, all because that's where the pictures were. I assumed I was bulletproof--until I got bent. My incident was more than a decade ago, but it was also on a live-aboard boat in Vanuatu, far away from help. There were no recompression chambers anywhere nearby, and had it been a more serious hit, I could have been in big trouble. The dive boat would have had to steam back to port for an air evacuation, and my aggressive dive profiles could have not only hurt me physically, but also cut short the dive holiday for the other 15 divers on board. As it turned out, I didn't dive anymore that week, but everyone else had a great time. It clearly illustrated to me the need for all divers to behave responsibly, because a dive accident inevitably affects everyone on the boat. Taking photographs under water is a privilege, not a right. Toting cameras below does not bestow upon the photographer any special status or rights. Whatever one's underwater interests--identifying fish, photographing them or just watching them--all divers should enter the water with an ample supply of humility and an appreciation of one another and the special place we are going. All contact is not necessarily bad contact. There are portions of the reef, particularly bits of rubble or algae-covered rocks, that are unaffected by careful finger or fin placement. Kneeling in the sand patches is certainly reef-friendly, so long as a photographer doesn't erupt in a cloud of detritus leaving the bottom, thereby silting the very coral reef you so admired a moment before. Before assigning guilt, make sure the photographer is actually in damaging contact with live coral. Sometimes the perspective of distance gives a false illusion of eco-terrorism. Because they can't change film or batteries under water, photographers often carry more than one camera system on a dive. If you find a camera resting on the bottom, don't assume it's yours for the taking. Appreciate the value of the equipment. Not everyone on a dive boat understands the value or the fragility of photographic equipment. The photographer bears the responsibility of keeping the gear on a dedicated camera table or somewhere out of the normal flow of traffic. Other divers on boats bear the responsibility of not dropping weight belts on dome ports or flinging saltwater droplets from wetsuits or hair as the photographer is changing film. A little space for photographers and their gear is essential. Use common sense with underwater encounters. If you see a photographer carefully stalking some elusive specimen of marine life, don't swim nearby. Just the sound of your regulator exhaust may blow the photo-op. If you see a photographer setting up a wide-angle shot on a vertical wall, don't swim directly beneath. Your exhaust bubbles will inevitably rise exactly where they shouldn't. Just because you see an unattended camera on the bottom, don't assume you've struck it rich. Photographers can't change film or batteries under water, so occasionally they will carry more than one camera or strobe on a dive. In fact, I do this often, moving the cameras to various parts of the reef and setting them carefully on the bottom when not in use. Yes, camera gear may get dropped and lost. But if it is a known dive site and the camera is sitting oh-so-carefully on sand or a bit of shipwreck, it is far more likely there is a photographer lurking nearby who will be very distressed to see you swimming away with your "prize." The rinse tank is no place for carelessness. This precaution is for photographers, non-photographers and divemasters. Too often, camera floods or dome damage occurs at the end of the dive in the rinse bucket. When multiple camera systems are placed in the rinse tank simultaneously, cords entwine framers and abrasive arms and trays inevitably bounce on delicate ports. Pulling one system out pulls something else off, and a flood ensues. The goal is to displace salt water with fresh water immediately, and to that end, a brief but thorough rinse is all that's required.